What a great and busy fortnight we have had here at the Stay Up Late and Gig Buddies team! 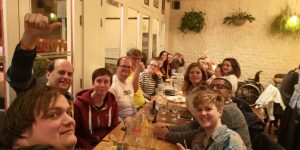 We had our Gig Buddies partners day, the Stay Up Late AGM, 5 socials, volunteer training, Carol from Gig Buddies Australia came for a visit, Paul spoke at the Social Care Futures and the Greater London Community Practise AND we hosted the Coventry Young Activists from Grapevine in Coventry! Phew – an exhausting and exhilarating couple of weeks for the team! Time to catch up on some admin me thinks! A highlight for me over the last fortnight was by far meeting the Coventry Young Activists from the Coventry. 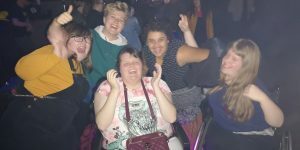 A group of very cool young people (15-25 years old) with learning disabilities. They wanted to come down and check out what Stay Up Late is all about and meet some Gig Buddies. We went for dinner with a few Brighton Gig Buddies and then off out to Concorde 2 for an electronica gig. For some in the group this was their first ever gig and for others the first electronica gig they had been to. 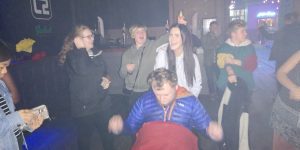 The music wasn’t to everyone’s taste but there were some seriously fab dancers amongst the group who threw their best shapes anyway! For those that didn’t like the music they all agree with Stay Up Late’s principle of – “it’s better to give it a try and know you don’t like something, then not get to try it at all”. The group chatted to us about their experiences of being young activists. 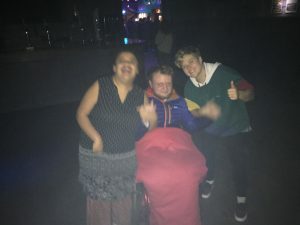 It struck me that the challenges that they face in Coventry and as young people are very similar to those that the people on the gig Buddies project. For example, a lack of accessible venues, transport links and societal attitudes. It was reassuring to listen to such an inspiring and motivated group of young people. Good luck to them all in their work in changing things for the better! 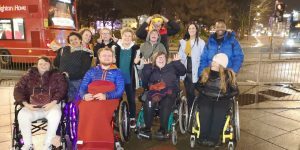 In true Stay Up Late style we ended the evening by having a wheelchair race along the sea front! A huge thank you to everyone who supports the work of the charity, big or small, and allows us to have busy but brilliant weeks!